Courtesy of RE/MAX Desert Showcase. Beautiful 2 story cabin located in the tall pines off Walker Rd past Lynx Lake. The cooler temps in the summer make this location a paradise which takes about 1.5 hours to reach from Phoenix. Built in 2005, this cabin sits on just over a 1/2 acre lot with beautiful views. The seasonal creek is a nice additional feature & it’s only approx 1/4 mile from the paved road. Accessible year round, the county plows Sheldon to Blue John. During heavy snow falls, you might need a truck but a small car can usually be sufficient. The exterior has stucco with a metal roof. Inside, there are two bedrooms with one bedroom downstairs with the master and master bath upstairs. Walkout balcony sets outside the master. The large wood burning fireplace keeps it nice and toasty on cold days and nights. Directions: Hwy 69, s on Walker @ Costco. Stay on Walker go past the Walker FD. When the pavement ends, cross the bridge strght ahead on Sheldon. Stay to R at fork, R on Blue John, rd curves to L. 1st house on L.
Approximate size: 23087.00 sq. ft. 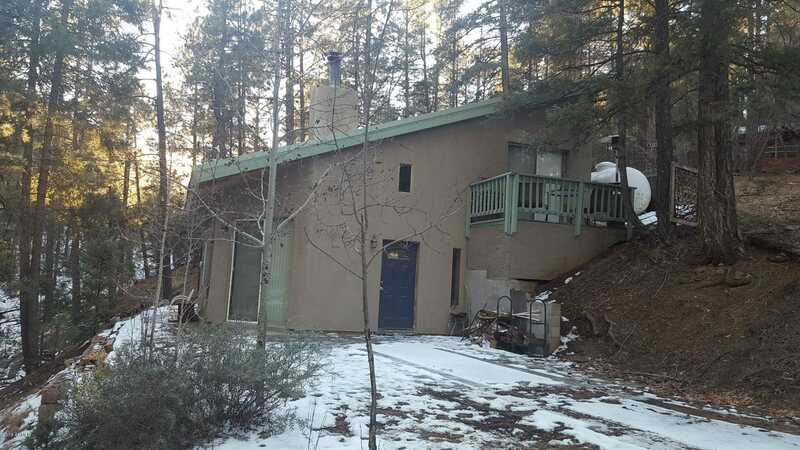 Please, send me more information on this property: MLS# 5868503 – $300,000 – 3985 E Blue John Lane, Prescott, AZ 86303. I would like to schedule a showing appointment for this property: MLS# 5868503 – $300,000 – 3985 E Blue John Lane, Prescott, AZ 86303.